Notes of February 2017 - be sure to read the comments section for more information on Annie Colby. 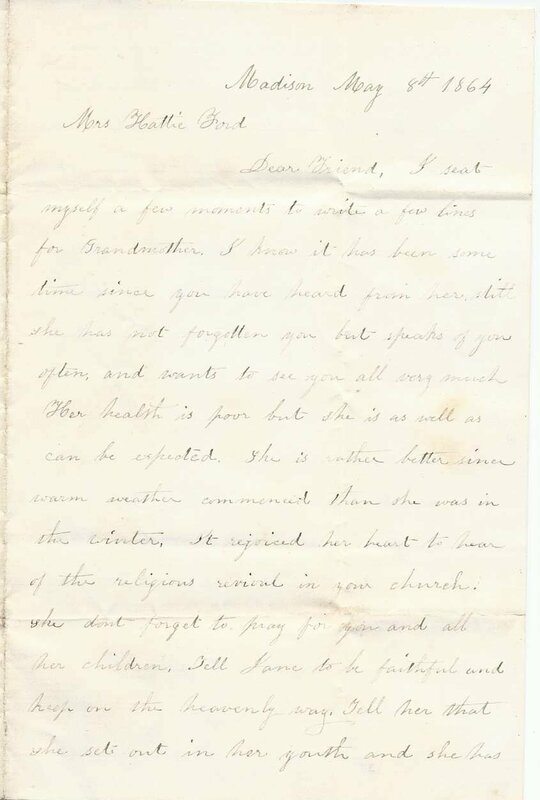 Letter sent from E. Churchill at Madison, presumably New Hampshire, judging from clues, to Mrs. Hattie Ford. Hopefully a reader will recognize the clues given in the letter to identify the people involved. One of the clues, a reference to the death of Emma Colby, shows that the letter has connections to Madison, New Hampshire, and Millbury, Massachusetts. 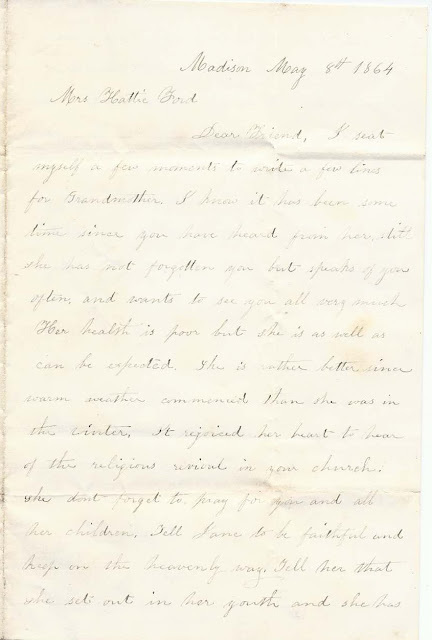 The letter was written on a paper approximately 8-1/4" x 6-1/4", folded once, with only two panes used. Emma Colby, who died April 11, 1864 - a death record shows that Emma Colby died at Millbury, Massachusetts on April 11, 1864 - presumably Anna Emma Colby, born at Madison, New Hampshire about 1849, daughter of James Madison Colby and wife Elizabeth (Jackson) Colby. Dear Friend, I seat myself a few moments to write a few lines for Grandmother. I know it has been some time since you have heard from her. Still she has not forgotten you but speaks of you often and wants to see you all very much. Her health is poor but she is as well as can be expected. She is rather better since warm weather commenced than she was in the winter. It rejoiced her heart to hear of the religious revival in your church. She don't forget to pray for you and all her children. Tell Jane to be faithful and keep in the heavenly way. Tell her that she sets out in her youth and she has never been sorry but the way grows brighter and brighter. She thinks of a good deal that she would write if she could, and hopes you will write her often. I suppose you have heard of the death of Emma Colby. She died the 11th of April. Betsey wrote us that she died happy, longed to be at rest. The rest of the family were well. 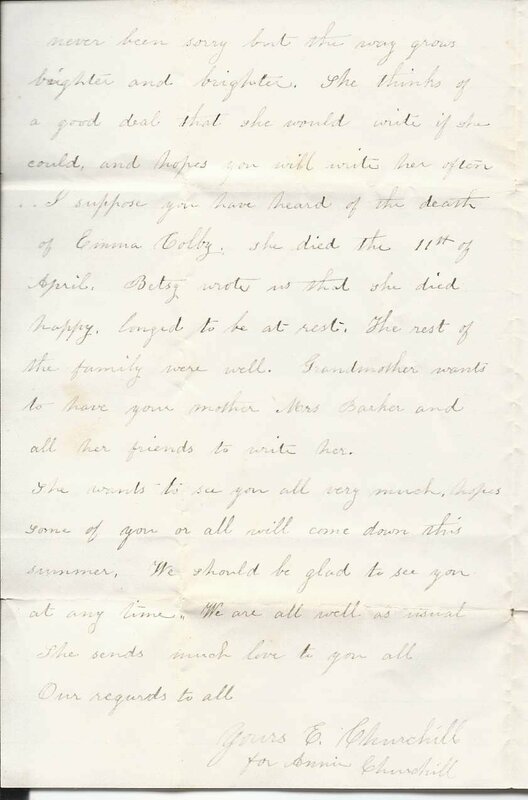 Grandmother wants to have your mother Mrs. Barker and all her friends to write her. She wants to see you all very much, hopes some of you or all will come down this summer. We should be glad top see you at any time. We are all well as usual. She sends much love to you all. If you have any theories as to the locale and identities of the people mentioned in the letter, please leave a comment or contact me directly. Emma Colby died 11 Apr. 1864 in Millbury, Mass. She was born in Madison, New Hampshire. Thanks, Chris, for this huge step forward. Will do some more digging and amend the post. Emma was the sister of the sculptor Madison Colby (1842-1871). Yes, the Colbys lived in Millbury MA. After their son Madison died on February 17, 1871, in Oakland CA, the funeral home kept him in a receiving vault (cold storage) until his remains could be sent back to Massachusetts. Several Colbys still live in the Millbury area. There is a Colby Avenue as well. We have found two of Madison's premiere works in storage in Lewiston, Idaho.